Claesen et al. recently presented an efficient method for computing the isotope pattern of a molecule, that is, both the isotope distribution and the center masses (also called “probability-weighted masses“ and “aggregated isotopic variants“ in ) of the isotope peaks. 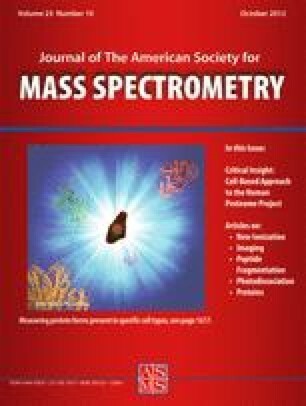 They favorably compare their approach against five other methods for simulating isotope patterns: Their tool BRAIN is more accurate than any other tool, and computation times are well below 1 s even for huge molecules of mass above 533403 Da and when computing 1325 peak masses. As default, SIRIUS uses the masses and abundances of isotopes from the AME2003 tables [5, 6] and abundances from . For the evaluations in this paper, we have instead used masses and abundances from the IUPAC 1997 standard , as it was done by Claesen et al. We have evaluated SIRIUS on the same set of molecules , see Table 1 and Table 2 in . For a fair comparison, we chose the number of computed center masses (mean peak masses) identical to those used in . We found that the theoretical average masses of some molecules slightly differ from those reported in , with up to 0.000002 Da mass difference. To this end, we repeated all calculation of theoretical average masses with arbitrary high precision (BigDecimal type in Java) but ended up with the same results as reported in Table 1. Also, molecule (7) (Human Na/K ATPase, Renal isoform, subunit) is missing 40 sulfur atoms in Table 2 of , compare to Table 3 in . The accuracy of SIRIUS is practically identical to that of BRAIN: Since SIRIUS also uses exact monoisotopic masses, the mass difference between calculated and theoretical monoisotopic peak is zero, compare to Table 3 in . For the average mass, the mass computed by SIRIUS (by taking the weighed sum over all masses of the isotope pattern) and the theoretical average mass are again identical, see Table 1 and compare to Table 4 in . Finally, we also compare the running times of SIRIUS and BRAIN: We report running times from  (Table 5) where BRAIN is implemented in Matlab and run on a Intel Core 2 Duo processor with 2.26 GHz and 4 GB RAM. SIRIUS was run on a MacBook Pro with Intel Core 2 Duo processor at 2.66 GHz and 4 GB RAM, using the Java virtual machine version 1.6.0. One can see that running times are very similar. We also evaluated the R implementation of BRAIN (again on the MacBook Pro) that is available as a Bioconductor package, http://bioconductor.org/packages/devel/bioc/html/BRAIN.html. Masses in Table 1 have been rounded to six decimal places, and it appears that this is also true for all tables in . In fact, there is a slight mass error for the average mass, that was well below 0.002 ppb (parts per billion) for all 10 molecules. We stress that a certain error is inevitable when computations are carried out using machine numbers, due to rounding error accumulation. When even higher mass accuracies are needed, other data types such as the BigDecimal type in Java can be used to reach an even higher accuracy, at the expense of increased running times. But this appears to be a wasteful undertaking, given that masses and, in particular, abundances of isotopes are known only with a rather limited precision. The convolution method implemented in SIRIUS [2, 3] is easy to understand and straightforward to implement. Also, this method is very fast when calculations are limited to only few (say, 10) peaks. This is important when many isotope patterns have to be simulated, for example in the SIRIUS pipeline where for each decomposition of the monoisotopic mass, an isotope pattern is simulated and compared against the measured isotope pattern . In this way, SIRIUS can decompose a monoisotopic mass, simulate isotope patterns for about 1000 molecular formulas, and match them against the measured pattern in less than a second . On the other hand, the mathematically more involved method of Claesen et al. possibly is faster for very large molecules such as the human dynein heavy chain. We note that SIRIUS is implemented in Java and, hence, runtime-compiled into Java bytecode, whereas BRAIN is implemented in R and, hence, interpreted. To this end, it is likely that a constant-factor improvement in running time can be reached, implementing BRAIN in a compiled language. On the other hand, SIRIUS has not been designed to compute isotope patterns of molecules this large, so it is likely that running times can be further improved if this is required. In full, it seems to be up to the user’s preferences, which method to choose, as both methods reach the same high accuracy and running times are very similar. On the other hand, BRAIN and, hence, also SIRIUS outperform all other methods evaluated in  (namely, Emass, Mercury, NeutronCluster, IsoPro, and IsoDalton) with respect to accuracy and sometimes even running time, see  for details. All computations were carried out by Franziska Hufsky.